There are three campgrounds and an RV Park in Big Bend. They are Chisos Basin (elevation 1,900 feet), Cottonwood (elevation 1,900 feet), and Rio Grande Village (elevation 1,850 feet) and Rio Grande Village RV Park. These campgrounds are open year round. Campsite occupancy is limited to eight people and two vehicles, or one RV plus one vehicle. No open campfires are allowed. * 26 Campsites at Chisos Basin can be reserved by Calling: 1-877-444-6777 or go Online. See Additional Camping Information Below. ** 43 Campsites at Rio Grand Village can be reserved by Calling: 1-877-444-6777 or go Online. See Additional Camping Information Below. No generators allowed in the Chisos Basin Campgrounds. Due to the narrow, winding road to the Basin, and small campsites, trailers over 20 feet and RV’s over 24 feet are not recommended at this campground. ALL GROUP CAMPSITES ARE ON THE RESERVATION SYSTEM. Reservations can be made 360 days in advance for a group campsite. Fees are: $ 3.00 per person, per night plus a reservation fee. 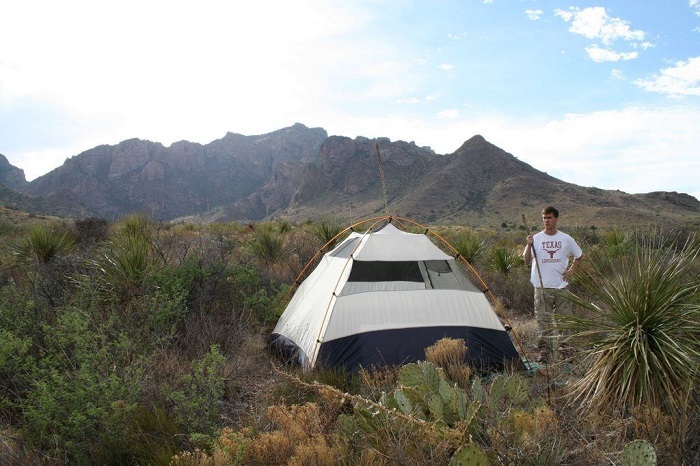 Chisos Basin Group Camping: The Chisos Basin Campground has six group camp sites that are available only by advance reservation. The total overnight occupancy for the Chisos Basin group campground is 118 persons. All sites in this campground have a minimum occupancy of 10 persons. Sites L, P, Q, and R hold a maximum of 20 persons each. Sites N and O hold a maximum occupancy of 14 persons each. Site M has a maximum occupancy of 10 persons. Tents larger than 8′ X 8′ are not recommended because of site layout; however, sites P, Q, and R can accommodate larger tents if necessary. Sites P, Q, and R have shade ramadas. Cottonwood Group Camping: The Cottonwood Campground has one group camp site that is available only by advance reservation. Maximum occupancy for this group campground is 25 persons. Minimum capacity is 10 persons. This group campground is walk-in tent camping only. Vehicle parking is restricted to an adjacent parking area. Rio Grand Village Group Camping: The Rio Grande Village Campground has four group camp sites that are available only by advance reservation. The total overnight occupancy for the Rio Grande Village group campground is 120 persons. All sites in this campground have a minimum occupancy of 10 persons. Sites A and B comprise the area on the east side of the comfort station. Maximum occupancy for each site is 20 persons. Sites C and D comprise the area on the west side of the comfort station. Maximum occupancy for each site is 40 persons. This group campground is walk-in tent camping only. Vehicle parking is restricted to an adjacent parking area. To reserve the group campsite, contact www.reserveusa.com or call 1-877-444-6777. Big Bend National Park cannot make reservations. The reserved sites at Rio Grande Village and Chisos Basin are on the Reservation System from November 15 to April 15 of each year and reservations can be made for these sites 240 days in advance. The non-reserved sites remain on a first come, first serve basis. ALL CAMP SITES AT CHISOS BASIN CAMPGROUND AND RIO GRANDE VILLAGE ARE FIRST COME, FIRST SERVE FROM APRIL 16 TO NOVEMBER 14 OF EACH YEAR. A parkwide limit of 14 days occupancy is in effect February 1 to April 15 for any developed campsite including the concession operated trailer sites at Rio Grande Village. During the rest of the year, a limit of 14 days occupancy is in effect per campground visit, but occupancy beyond 14 days may be authorized by campground managing personnel on a day to day basis if sites are available for new arrivals. A limit of 28 nights per year is in effect. During holiday periods, particularly Easter / Spring Break, Thanksgiving, and Christmas, the main campgrounds and most primative sites are likely to be full. If you plan to camp in the primitive sites, come prepared with a portable table, folding chairs, water container, and a portable grill. In addition to the primitave areas within the park, there are several private camping facilities adjacent to the park. Backpackers have many opportunities throughout the park. Open (zone) camping is available in desert areas with a backcountry permit. Designated backcountry campsites in the high Chisos Mountains are available with a backcountry permit on a first-come, first-serve basis. This permit must be obtained in person up to 24 hours in advanced of your trip. Because of the unreliability of desert springs, it is virtually impossible to plan an extended backpacking trip prior to your arrival in the park. Bear in mind how much distance you want to cover and how much time you have. Based on that information and current conditions, personnel at park visitor centers can assist you with your trip planning. You can begin to familiarize yourself with Big Bend’s trails by obtaining a “Hiker’s Guide, Chisos Mountains Trails” guide, and topo maps of the park. These can be purchased at visitor centers upon arrival in the park, or they can be ordered in advance of your visit from the Big Bend Natural History Association by writing or calling.